Stuffed peppers are a great dish to enjoy in late summer when green bell peppers and tomatoes are in season, perhaps grown in your own garden. Certainly, home-grown tomatoes will give the most flavor, but you can substitute canned diced tomatoes if necessary. This is an all-in-one dish that includes veggies, meat, and starch. To make it part of a meal, think of serving a crisp lettuce salad as it will complement the soft textures of the stuffed pepper. Crusty rolls would go with it well also. As a tenth generation Cajun, I have family heirloom recipes, including my great-grandmother's two-page, handwritten recipe for these stuffed bell peppers. The pages are held together with a rusted straight pin. I work from a photocopy of the recipe, as I want to preserve this very old treasure, without handing splatters of chopped tomato down to future generations. In the handwritten recipe, my great-grandmother wrote, "Cook the meat until it wants to start flying." Chop the tomato (or measure out 1 cup drained diced canned tomatoes) and set aside. Bring a large pot of water and the tablespoon salt to a boil and carefully drop the peppers into the boiling water. Bring back to a boil, and boil the peppers for 5 minutes. Remove and drain. Prepare the peppers by cutting around the stem on the top and removing the stem. Remove as many of the seeds as possible without cutting into the bottoms or sides of the peppers. In a large skillet, cook the ground pork and beef over medium-high heat until the meat is browned, then add the hot water. Cook until the water evaporates, about 5 minutes, then add the tomato and onion and cook for 10 minutes, stirring often. Stir the cooked rice, 1 teaspoon salt, black pepper, and white pepper into the meat mixture and stir to combine. Remove from the heat and stuff the peppers with the meat mixture. Put the stuffed peppers into a baking pan that holds them snugly, and bake in the preheated oven, uncovered, for 30 minutes. Store any leftover stuffed peppers in the refrigerator, covered. They should be eaten within four days and reheat easily in the microwave. You can freeze leftover stuffed peppers to keep them longer. Label them with the date frozen and use them within six months for the best quality. You can prepare and stuff the peppers a day ahead of time. Keep them covered and refrigerated. Add 10 minutes to the baking time. 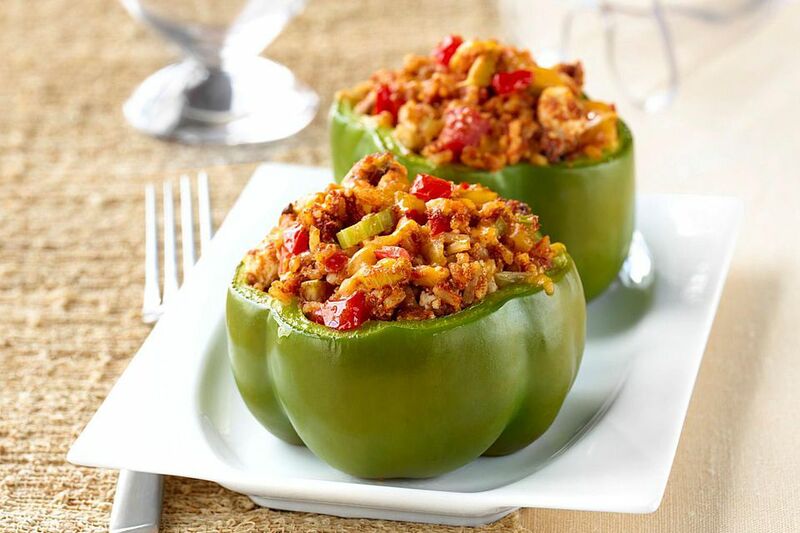 Stuffed peppers are a classic for good reason!